NICE has recommended Keytruda in second line lung cancer use after Merck Sharp & Dohme cut its price. The decision is a major win for MSD, which will now have the upper hand on BMS and its rival treatment Opdivo, which has been put forward for restricted use through the new Cancer Drugs Fund (CDF). There remains uncertainty about how much longer Keytruda can help patients live, as the data is still not mature. MSD says the drug could give second line patients as much as 11 months longer compared to standard therapy docetaxel (between 21.2 and 22.8 months compared with 10.4 months). However NICE said this was ‘optimistic’ but conceded the extra life was likely to be more than 3 months. Lung cancer kills more people than any other form of cancer: more than 35,000 in the UK each year. However only of fraction of these are able to benefit from the ruling. There are an estimated 2,000 people in England with locally advanced or metastatic NSCLC who may test positive for the PD-L1 biomarker, and who could therefore benefit from Keytruda in this setting. Nevertheless, the ruling has been hailed as a ‘milestone’ by lung cancer campaigners, as it is the first full approval for the new generation of immunotherapy cancer treatments, which could lead to much longer survival for patients with advanced cancer. Despite the relatively small numbers set to benefit, NHS England were concerned about the impact of the drug on NHS budgets, and insisted that no patient should be treated for longer than two years. The list price of Keytruda for an average treatment duration is around £29,000, which NICE originally ruled made it not cost effective. NICE changed its mind in this second draft guidance, thanks to what must have been a big price cut offered by MSD – however the size of that reduction remains confidential. The cost-effectiveness body recommended Keytruda in locally advanced or metastatic PD L1-positive non-small-cell lung cancer in adults who have had at least one chemotherapy, and targeted treatment if certain mutations are present. MSD has agreed to supply the drug at a commercially confidential discount, which was enough to convince NICE it is cost-effective because of greater leeway for treatments given to patients at the end of their lives. But the cost-effectiveness body has limited the treatment period for two years due to uncertainty in its calculations beyond this point. NICE made its ruling because in the key KEYNOTE-010 phase 2/3 trial, the study protocol stated patients received Keytruda for a maximum of two years, unless the disease progressed, or the drug became too toxic. 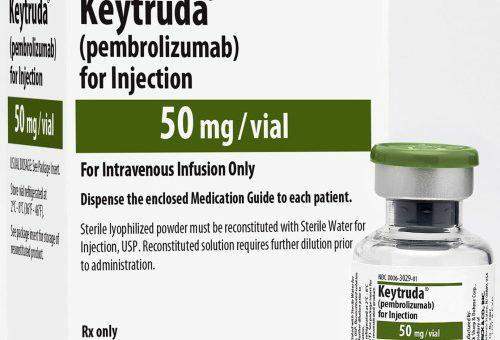 Keytruda’s label does not require treatment to be stopped after two years and the number of patients receiving treatment after two years remains small, NICE noted in its guidance. Longer term data on optimum treatment length will be available within around two years. In October, NICE issued final draft guidance to only fund Bristol-Myers Squibb’s rival, Opdivo, in non-small cell lung cancer patients whose tumours over-express PD-L1. Even then the drug is likely to be reimbursed on an interim basis by the Cancer Drugs Fund until better study data becomes available. Keytruda and Opdivo are both PD-1 inhibitors, which instruct T-cells to attack cancer. The next big test for MSD, Keytruda and NICE will be the question of first line use. The drug gained US approval for first line use against NSCLC in October, and is expected to gain European approval in this setting in 2017. Paula Chadwick, chief executive of Roy Castle Lung Cancer Foundation, welcomed the announcement as a ‘breakthrough’ for patients and their families. She said she hoped the decision would pave the way for further positive decisions for lung cancer patients across the UK. Martin Grange, Trustee of Roy Castle Lung Cancer Foundation – and himself a lung cancer patient – also welcomed the news. He said: “Lung cancer takes up only 6% of the research funding spent on the ‘big four’ cancers. That is despite lung cancer being the UK’s biggest cancer killer. Alongside many of our supporters, we have campaigned tirelessly to address this. “Today’s announcement from NICE is a real milestone. We congratulate all those involved and hope it paves the way for many more decisions that will help to fight this dreadful disease”. “Today’s news marks an important step in our ongoing efforts to bring forward an important new personalised treatment approach for advanced lung cancer patients.” said Louise Houson, Managing Director, MSD UK and Ireland. The FAD forms the basis of the final guidance to the NHS in England and, pending no change, final guidance for Keytruda will be issued in January 2017. However in the interim, Keytruda is immediately available to eligible advanced NSCLC patients via the CDF.